Mary Queen of Scots is a Protected content drama film directed by Josie Rourke and written by Beau Willimon, based on John Guy's biography Queen of Scots: The True Life of Mary Stuart. 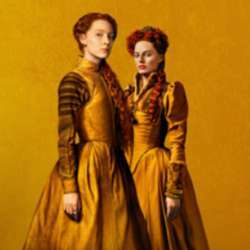 The film stars Saoirse Ronan as Mary, Queen of Scots and Margot Robbie as her cousin Queen Elizabeth I, and chronicles the Protected content between their two countries. Jack Lowden, Joe Alwyn, David Tennant, and Guy Pearce also star in supporting roles. The film received three nominations at the 72nd British Academy Film Awards, and two nominations for Best Costume Design and Best Makeup and Hairstyling at the 91st Academy Awards. For her performance, Robbie earned nominations for a SAG Award and BAFTA Award for Best Supporting Actress, respectively. The movie starts at 18:15. Please make sure to arrive at least 30 minutes before to pick up your ticket reservation or buy the ticket in advance.